A to Z Treez is locally owned and operated by Joe Thomas. He has been offering his services to Cape Cod since 2004. Joe is a former commercial fisherman who saw the need for a good quality tree service in his area. He chose to learn from other people in the trade using a hands on approach. He got A to Z off the ground and the business has been growing ever since. He is constantly purchasing new equipment to address your needs. 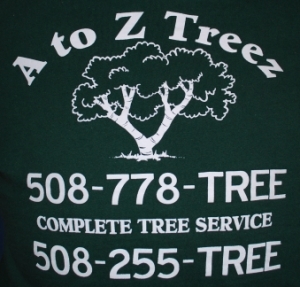 A to Z Treez has a staff of 12 ready to serve you, from the 1st phone call til the last branch is picked up and the last stump has been ground.